I've been without an oven for a couple weeks. The oven just wouldn't heat up - one day it worked, and the next it didn't. I thought the bake element had gone out (like I would really know why my oven won't heat up), but it was more serious. The oven needed a new control board, and then it took a while to get it fixed because they had to order the new part, and then the guy who came to put it in couldn't get the oven out of the wall. And it was the wrong part. So, they re-ordered the part, and two guys came to put it in yesterday. It took a bit, but they finally figured how to slide the oven out of the wall/cabinet enough to put the part in. And now my oven works! Of course, I had to test it, so I made this apple bread. Yep, the oven works again!!!!!! Cream butter and sugar together; add eggs. Mix well and add apples and vanilla. Mix dry ingredients and stir in. Pour batter into a well-greased loaf pan. Bake at 350 for 1 hour or until a toothpick comes out clean. Turn pan on side to cool on wire rack. The original recipe did not call for whole wheat flour, so you can make this with all white flour- but why would you want to? The whole wheat just gives it some extra substance and flavor. I also used pecans instead of the walnuts called for and added the dried cranberries at the last, just because. They are so good in this! Oh, and I reduced the sugar from 1 cup down to 3/4 cup with part of it being brown sugar, for the flavor. It's time again for Secret Recipe Club (Secret Recipe Club) reveal! This month I got to choose a recipe from the awesome blog delishhh. The blog is written by Ewa [eva], a happy Swede living in Seattle, WA. 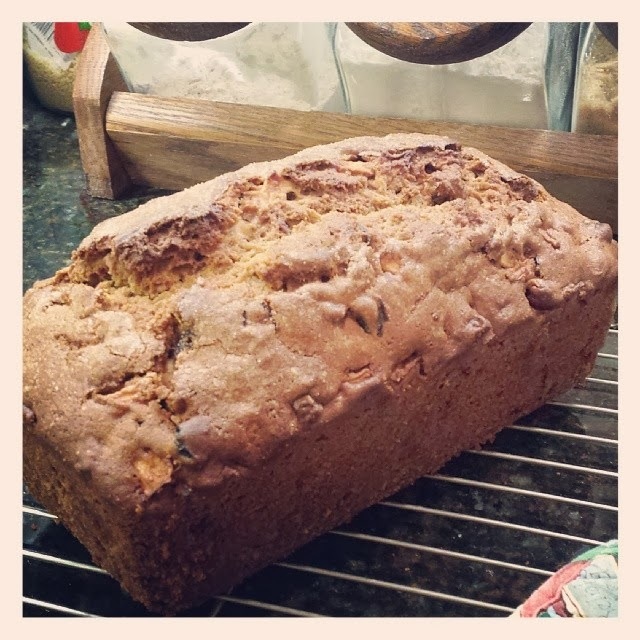 Her blog is full of delicious recipes, and once again I had trouble picking just one. Unfortunately, my oven is not working right now, so I'll have to try the Rhubarb Cheesecake and Rhubarb Chocolate Chip Banana Bread later. Notice they both have rhubarb. I think Ewa likes rhubarb as much as I do! But, since I can't bake, I started looking at some other recipes. I thought about making some Frozen Strawberry Daiquiris, with frozen strawberries since fresh ones aren't really in season right now. Or this Peach Sorbet with frozen peaches for the same reason - though I did see some huge peaches in the store the other day, and I was tempted to grab some. Instead, I decided to make some Rum Raisin Ice Cream. 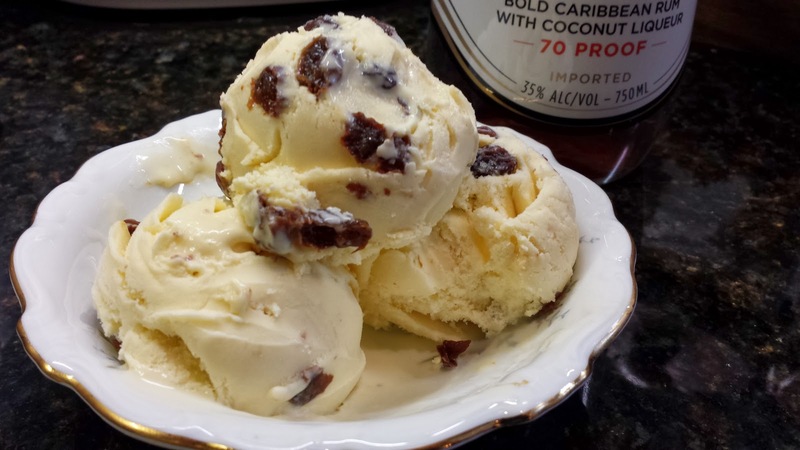 My favorite Haagen-Dazs flavor was always Rum Raisin. I don't get it very often, and there for a while I had trouble even finding it - so, of course, I always had to check. Somewhere along the line I kind fo forgot about it, so when I saw this recipe, it brought back fond memories, and I just had to try it. 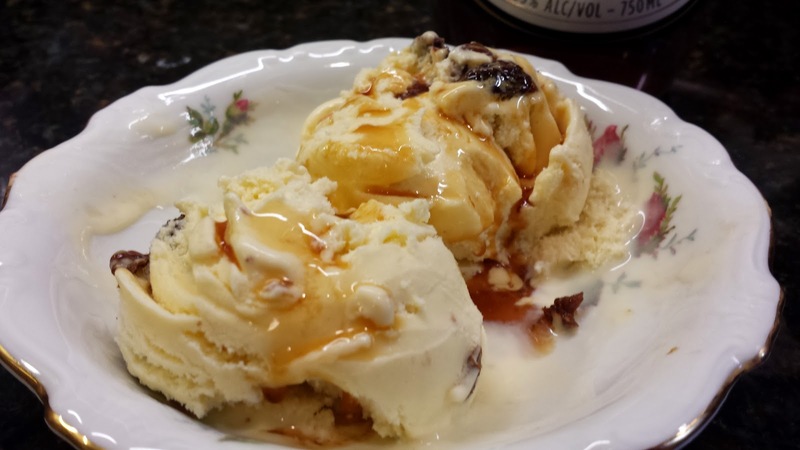 I also just recently bought a new Hamilton Beach Ice Cream Maker , and I really needed to try it out. Soak the raisins in rum overnight. Heat the milk, salt, and sugar in a saucepan, until sugar is dissolved and the mixture starts to steam. Set up an ice bath by placing a 2-quart bowl in a larger bowl partially filled with ice and water. Set a strainer over the top of the smaller bowl and pour the cream into the bowl. In a separate bowl, beat the egg yolks. Gradually pour some of the milk into the yolks, whisking constantly as you pour. Scrape the warmed yolks and milk back into the saucepan. Cook over medium-low heat, stirring constantly and scraping the bottom with a heat-resistant spatula, until the custard thickens enough to coat the spatula. Strain the custard into the heavy cream and stir over the ice until cool. Add the vanilla extract, then refrigerate to chill thoroughly, preferably overnight. Drain the rum from the raisins. Freeze in your ice cream maker according to the manufacturer’s instructions. 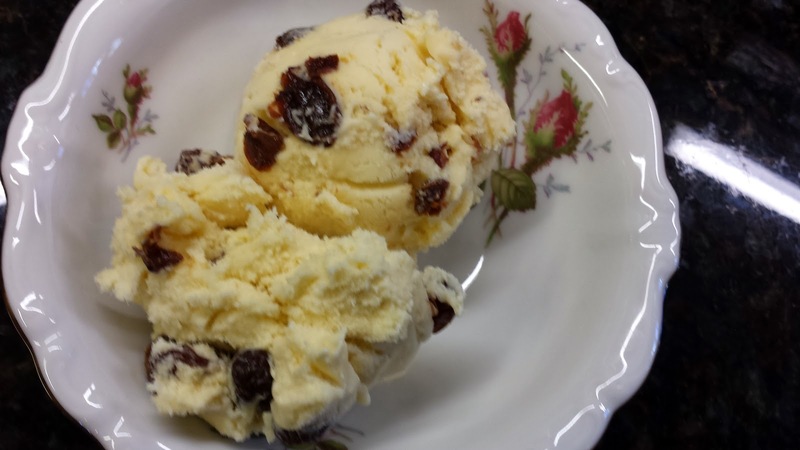 Depending on your ice cream maker, you will either add the raisins to the custard before pouring it into the ice cream maker, or wait and add them when the mixture is partially frozen. Serve immediately or scoop ice cream out of ice cream maker, put into a freezer container and freeze for several hours before serving. Ewa used a vanilla bean in her recipe, so there was an extra step after she heated the milk and sugar, where she added the vanilla bean and allowed it to infuse the milk for an hour. I skipped that step because I just plain forgot to even look for vanilla beans when I went to the store. Also, I forgot to use the strainer to pour my custard into my cream, because I hadn't used it in a while so I rinsed it and set it aside to dry while I was cooking the custard - and then forgot all about it. I'm not really sure why I needed the strainer, so I don't think that hurt anything. 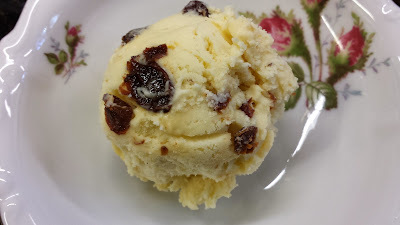 I definitely had to freeze the ice cream for several hours after the ice cream maker finished, because it was a very soft version of soft-serve ice cream - not the texture I think of when I think of Rum Raisin ice cream. After freezing, it was hard enough to scoop but still soft and creamy. This ice cream is SO GOOD! 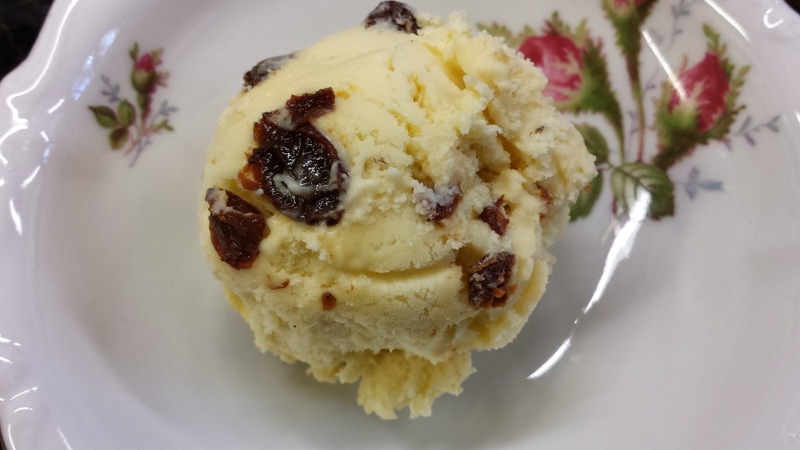 I haven't bought rum raisin ice cream in ages, so I can't tell you if this tastes the same - or better - but I do know that it is yummy, and I will be making this one again. Rum Raisin is still one of my favorite ice cream flavors. 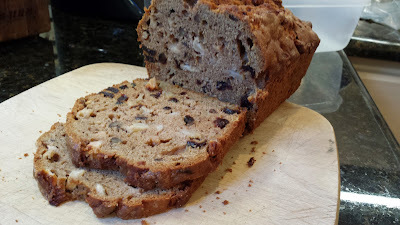 Wondering what to do with the rum you drain off the raisins? Drizzle it on top of the ice cream! YUM! I'm excited about making all kinds of ice creams now that I've got the ice cream maker. I love that I can have delicious ice cream for probably about the same cost as the store-bought stuff - or less in the case of this Rum Raisin - only I know exactly what ingredients are going into it.